The seventh Enterprise (CV-6) was launched 3 October 1936 by Newport News Shipbuilding and Drydock Co., Newport News, Va, sponsored by Mrs. ClaudeA. Swanson, wife of the Secretary of the Navy; and commissioned 12 May 1938, Captain N. H. White in command. Enterprise sailed south on a shakedown cruise which took her to Rio deJaneiro, Brazil. After her return she operated along the east coast andin the Caribbean until April of 1939 when she was ordered to duty in thePacific. Based first on San Diego and then on Pearl Harbor, the carrier trained herself and her aircraft squadrons for any eventuality, and carried aircraft among the island bases of the Pacific. Enterprise had just completed one such mission, delivering Marine Corps Fighter Squadron 211 to Wake Island on 2 December 1941, and was en route to Hawaii when the Japanese attackedPearl Harbor. Enterprise's scout planes arrived over Pearl Harbor during the attack and, though surprised, immediately went into action in defense of the navalbase. The carrier, meanwhile, launched her remaining aircraft in a fruitlesssearch for the Japanese striking force. Enterprise put into Pearl Harbor for fuel and supplies on December and sailed early the next morning to patrolagainst possible additional attacks on the Hawaiian Islands. While the groupdid not encounter any surface ships, Enterprise aircraft scored a kill by sinking submarine 1-170 in 23?45' N., 165?35' W., on 10 December1941. During the last 2 weeks of December 1941, Enterprise and her group steamedto the westward of Hawaii to cover those islands while two other carriergroups made a belated attempt to relieve Wake Island. After a brief restat Pearl Harbor, the Enterprise group sailed on 11 January to protect convoysreinforcing Samoa. On 1 February the task force dealt a hard blow to KwajaleinWotje, and Maloelap in the Marshall Islands, sinking three ships, damagingeight, and destroying numerous airplanes and ground facilities. Enterprise received only minor damage in the Japanese counterattack, as her force retiredto Pearl Harbor. During the next month Enterprise's force swept the central Pacific, blastingenemy installations on Wake and Marcus Islands, then received minor alterationsand repairs at Pearl Harbor. On 8 April 1942 she departed to rendezvouswith Hornet (CV-8) and sail westward to launch 16 Army B-25 bombers in araid on Tokyo. While Enterprise fighters flew combat air patrol, the B-25 soared into the air on 18 April and raced undetected the 600 miles to theirtarget. The task force, its presence known to the enemy, reversed courseand returned to Pearl Harbor on 25 April. Five days later, the "Big E" was speeding toward the SouthPacific to reinforce the U.S. carriers operating in the Coral Sea. Distanceproved too great to conquer in time, and the Battle of the Coral Sea was history before Enterprise could reach her destination. Ordered back to Hawaii,the carrier entered Pearl Harbor on 26 May and began intensive preparationsto meet the expected Japanese thrust at Midway Island. Two days later shesortied as flagship of Rear Admiral Raymond A. Spruance, CTF 16, with orders"to hold Midway and inflict maximum damage on the enemy by strong attritiontactics." With Enterprise in TF 16 were Hornet, 6 cruisers, and 10destroyers. On 30 May, TF 17, Rear Admiral Frank J. Fletcher in Yorktown(CV-5), with two cruisers, and six destroyers, sailed to support TF 16;as senior officer, Rear Admiral Fletcher became "Officer in TacticalCommand." Battle was joined on the morning of 4 June 1942 when four Japanese carriers,unaware of the presence of U.S. forces, launched attacks on Midway Island.Just 3 hours after the first bomb fell on Midway, planes from Hornet struckthe enemy force, and 30 minutes later Enterprise and Yorktown aircraft streakedin to join in smashing the Japanese carriers. Each side hurled attacks atthe other during the day in one of history's most decisive battles. Thoughthe forces were in contact to 7 June, by the end of the 4th the outcomehad been decided and the tide of the war in the Pacific had been turnedin the United States' favor. Yorktown and Hammann (DD412) were the onlyUnited States ships sunk, but TFs 16 and 17 lost a total of 113 planes,61 of them in combat, during the battle. Japanese losses, far more severe,consisted of 4 carriers, 1 cruiser, and 272 carrier aircraft. Enterpriseand all other ships of TFs 16 and 17 came through undamaged, returning to Pearl Harbor on 13 June 1942. After a month of rest and overhaul, Enterprise sailed on 15 July for the South Pacific where she joined TF 61 to support the amphibious landingsin the Solomon Islands on 8 August. For the next 2 weeks, the carrier andher planes guarded seaborne communication lines southwest of the Solomons.On 24 August a strong Japanese force was sighted some 200 miles north ofGuadalcanal and TF 61 sent planes to the attack. An enemy light carrierwas sent to the bottom and the Japanese troops intended for Guadalcanalwere forced back. Enterprise suffered most heavily of the United Statesships, 3 direct hits and 4 near misses killed 74 wounded 95, and inflictedserious damage on the carrier. But well-trained damage control parties,and quick hard work patched her up so that she was able to return to Hawaiiunder her own power. Repaired at Pearl Harbor from 10 September to 16 October, Enterprisedeparted once more for the South Pacific where with Hornet, she formed TF61. On 26 October, Enterprise scout planes located a Japanese carrier forceand the Battle of the Santa Cruz Island was underway. Enterprise aircraftstruck carriers battleships, and cruisers during the struggle, while the"Big E" herself underwent intensive attack. Hit twice by bombs,Enterprise lost 44 killed and had 75 wounded. Despite serious damage, shecontinued in action and took on board a large number of planes from Hornetwhen that carrier had to be abandoned. Though the American losses of a carrierand a destroyer were more severe than the Japanese loss of one light cruiser,the battle gained priceless time to reinforce Guadalcanal against the nextenemy onslaught. Enterprise entered Noumea, New Caledonia, on 30 October for repairs,but a new Japanese thrust at the Solomons demanded her presence and shesailed on 11 November, repair crews from Vestal (AR-4) still on board, workingvigorously. Two days later, "Big E" planes swarmed down on anenemy force and disabled a battleship which was sunk later by other Americanaircraft, and on 14 November, aviators from Enterprise helped to despatcha heavy cruiser. When the Naval Battle of Guadalcanal ended on 15 November1942, Enterprise had shared in sinking 16 ships and damaging 8 more. Thecarrier returned to Noumea on 16 November to complete her repairs. Sailing again on 4 December, Enterprise trained out of Espiritu Santo,New Hebrides, until 28 January 1943 when she departed for the Solomons area.On 30 January her fighters flew combat air patrol for a cruiser destroyergroup during the Battle of Rennell Island. Despite the destruction of alarge majority of the attacking Japanese bombers by Enterprise planes, Chicago(CA-29) was sunk by aerial torpedoes. Detached after the battle, the carrier arrived at Espiritu Santo on 1 February, and for the next 3 months operatedout of that base, covering U.S. surface forces up to the Solomons. Enterprisethen steamed to Pearl Harbor where, on 27 May 1943, Admiral Chester W. Nimitzpresented the ship with the first Presidential Unit Citation won by an aircraftcarrier. On 20 July 1943 she entered Puget Sound Navy Yard, Bremerton, Wash,for a much needed overhaul. Back in action waters by mid-November, Enterprise joined in providingclose air support to the Marines landing on Makin Island, from 19 to 21November. On the night of 26 November 1943, the "Big E" introducedcarrier-based night fighter operations in the Pacific when a three-plane team from the ship broke up a large group of land-based bombers attackingTG 50.2. After a heavy strike by aircraft of TF 50 against Kwajelein on4 December, Enterprise returned to Pearl Harbor 5 days later. The carrier's next operation was -with TF 58 in softening up the MarshallIslands and supporting the landings on Kwajalein, from 29 January to 3 February.Then Enterprise sailed, still with TF 58, to strike the Japanese naval baseat Truk in the Caroline Islands, on 17 February. Again the "Big E"made aviation history when she launched the first night radar bombing attackfrom any U.S. carrier. The 12 torpedo bombers in this strike achieved excellent results, accounting for nearly one-third of the 200,000 tons of shipping destroyed by the aircraft of the task force. Detached from TF 58, Enterprise launched raids on Jaluit Atoll on 20February, then steamed to Majuro and Espiritu Santo. Sailing 15 March in TG 36.1, she provided air cover and close support for the landings on EmirauIsland (19-25 March). The carrier rejoined TF 58 on 26 March and for thenext 12 days joined in the series of hard-hitting strikes against the Yap,Ulithi, Woleni, and the Palau Islands. After a week's rest and replenishmentat Majuro, Enterprise sailed (14 April) to support landings in the Hollandia area of New Guinea, and then hit Truk again (29 30 April). On 6 June 1944, the "Big E" and her companions of TG 58.3 sortiedfrom Majuro to strike with the rest of TF 58, the Mariana Islands. BlastingSaipan, Rota, and Guam between 11 and 14 June, Enterprise pilots gave directsupport to the landings on Saipan on 15 June, and covered the troops ashore for the next 2 days. Aware of a major Japanese attempt to break up the invasion of Saipan, Admiral Raymond A. Spruance, Commander 5th Fleet, positionedTF 58 to meet the thrust. On 19 June 1944 took place the greatest carrier aircraft battle in history. For over 8 hours airmen of the United Statesand Imperial Japanese navies fought in the skies over TF 58 and the Marianas.By the end of the day, a United States victory was apparent, and at theconclusion of the strikes against the Japanese fleet on 20 June, the triumphbecame complete. Six American ships had been damaged, and 130 planes anda total of 76 pilots and air crewmen had been lost. But with a major assistfrom U.S. submarines, 3 Japanese carriers were sunk, and 426 ship-basedaircraft were destroyed. Japanese naval aviation never recovered from this blow. The Battle of the Philippine Sea over, Enterprise and her companionscontinued to support the Saipan campaign through 5 July. Enterprise thensailed for Pearl Harbor and a month of rest and overhaul. Back in actionwaters on 24 August, the carrier sailed with TF 38 in that force's aerial assault on the Volcano and Bonin Islands from 31 August to 2 September,and Yap, Ulithi, and Palaus from 6 to 8 September. After operating westof the Palau Islands, the "Big E" joined other units of TF 38on 7 October, and shaped course to the northward. From 10 to 20 Octoberher aviators roared over Okinawa, Formosa, and the Philippines, blasting enemy airfields, shore installations, and shipping in preparation for theassault on Leyte. 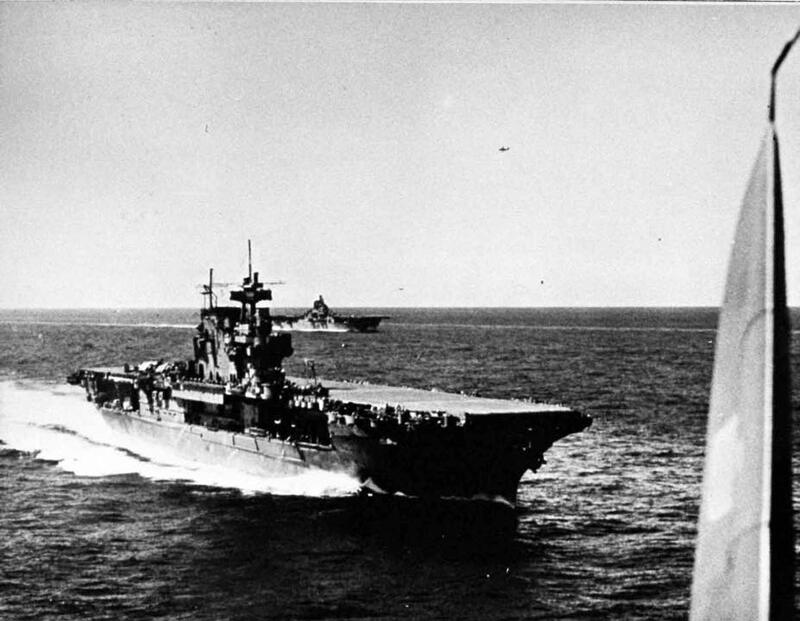 After supporting the Leyte landings on 20 October, Enterpriseheaded for Ulithi to replenish but the approach of the Japanese fleet on 23 October, brought her racing back into action. In the Battle for Leyte Gulf (23-26 October), Enterprise planes struck all three groups of enemyforces, battering battleships and destroyers before the action ended. The carrier remained on patrol east of Samar and Leyte until the end of October,then retired to Ulithi for supplies. During November, her aircraft strucktargets in the Manila area, and the island of Yap. The "Big E"returned to Pearl Harbor on 6 December 1944. Sailing 26 December for the Philippine area, Enterprise carried on boardan air group specially trained in night carrier operations. She joined TG38.5 and swept the waters north of Luzon and of the China Sea during Januaryof 1945, striking shore targets and shipping from Formosa to Indo-China.After a brief visit to Ulithi, the "Big E" joined TG 58.6 on 10February 1945, and provided day and night combat air patrol for TF 68 asit struck Tokyo on 16 and 17 February. She then supported the marines on Iwo Jima from the day of the landings, 19 February, until 9 March when shesailed for Ulithi. During one part of that period, Enterprise kept aircraftaloft continuously over Iwo Jima for 174 hours. Departing Ulithi 16 March,the carrier continued her night work in raids against Kyushu, Honshu, and shipping in the Inland Sea of Japan. Damaged slightly by an enemy bomb on18 March, Enterprise entered Ulithi 6 days later for repairs. Back in actionon 5 April, she supported the Okinawa operation until again damaged (11April), this time by a suicide plane, and forced back to Ulithi. Off Okinawa once more on 6 May, Enterprise flew patrols around the clock as the menaceof the kamikaze increased. On 14 May 1946, the "Big E" sufferedher last wound of World War II when a suicide plane destroyed her forward elevator, killing 14 and wounding 34 men. The carrier sailed for repairsv.t the Puget Sound Navy Yard, arriving 7 June 1946. Restored to peak condition, Enterprise voyaged to Pearl Harbor, returningto the States with some 1,100 servicemen due for discharge, then sailed on to New York, arriving 17 October 1945. Two weeks later she proceededto Boston for installation of additional berthing facilities, then begana series of "Magic Carpet" voyages to Europe, bringing more than 10,000 veterans home in her final service to her country. Enterprise enteredthe New York Naval Shipyard on 18 January 1946 for inactivation, and wasdecommissioned on 17 February 1947. The "Big E" was sold on 1July 1968.